This is a yummy pasta sauce that is a step away from the traditional tomato and meat sauce that we normally eat. I read about this recipe on the Parents Magazine website. I was hooked as soon as I read the first ingredient: BACON! MMmmm! I knew I had to make this recipe. Cook diced bacon on medium heat until cooked through, but not crisp. Drain bacon on paper towels, set aside. Discard drippings. DO NOT WIPE OUT THE PAN! Add tomatoes (with juice) and seasonings to the pan, stir. Remove from heat, add peas, sour cream and drained bacon. Pour over your favorite cooked pasta and serve. I rarely follow a recipe as it's written, this is one of the few exceptions. Although, I did add some crushed red pepper flakes for an extra kick! We really love this recipe! It's quick and easy! Frugal too, if there's a sale on bacon! This post can also be found on my other blog, My Vintage Kitchen. Anything with bacon HAS to be good! Thanks! This sounds really good and like something everyone in my family will like. I am going to save this and give it a try soon. Thanks for sharing! 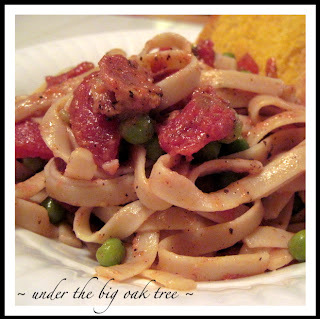 Your Pasta with Tomato Bacon Sauce will be a hit here at Full Plate Thursday. Thank you so much for bringing your wonderful dish and you have a great week end! YUM!! I'm your newest follower. Stopping by from Full Plate Thursday to say hello! I'm with Debbi, bacon in there and it must be good! Wow. You had me at bacon and pasta. Seriously, the words just go well together. My heart sings. Visiting from It's a Keeper and I'm so glad I did! Lovely pasta and really easy sauce. :) Thanks for sharing.